Tripp, Analisa. 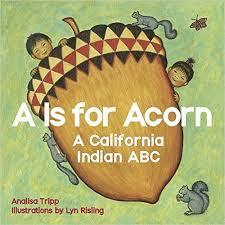 A is for Acorn: A California Indian ABC. Illus by Lyn Risling. Heyday Books, 2015. 28p. $9.99. ISBN 978-1-59714-316-5. With lovely colored pencil illustrations, this simple ABC of things relating to California Indian culture would make a great gift book, but libraries should also consider purchasing multiple copies. It works well as an alphabet book, with just the letter and one word, such as basket, canoe, or deer representing that letter. It will also work with 3rd and 4th grade classes studying local and California history; students can look up each item, such as yucca, and discover why it is important to a particular tribe. The author and illustrator are both Karuk tribe members with extensive personal and educational experiences with the cultures of California Indians. Ajmera, Maya. Global Baby Bedtimes. Charlesbridge, 2015. 18p. $6.95. ISBN 978-1-58089-708-2. In this fifth board book from the Global Fund for Children, color photos of sleeping and yawning babies are captioned with the name of the country of origin, along with a brief description of where babies sleep. All major ethnic groups are represented in this celebration of babies around the world; highly recommended. Aardman Animations Ltd. Shaun the Sheep Movie: Timmy in the City. Candlewick, 2015. 22p. $7.99. ISBN 978-0-7636-7875-3. Based on the popular Claymation-style animated film, Timmy is a young sheep in a flock led by Shaun, who live on a farm in the UK. Illustrated with color stills from the film, and with a text a little too wordy for the audience, this is likely to appeal only to fans of the film so it is not an essential purchase. Patricelli, Leslie. Boo! Candlewick, 2015. 28p. $6.99. ISBN 978-0-7636-6320-9. In the newest entry featuring the popular baby with one springy hair growing out of its head, Halloween is coming. A pumpkin is chosen, a costume decided upon (a traditional ghost made out of a sheet), and trick-or-treating begins. The deeply saturated colors of the cartoonish illustrations work well with the simple declarative text. A great choice for a baby storytime and for library circulation. Laden, Nina. Peek-a-BOO! Chronicle, 2015. 20p. $6.99. ISBN 978-1-4521-3396-6. 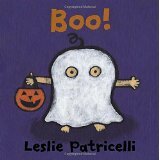 Die-cut holes lead to full-color illustrations of various things related to Halloween in this companion to Laden’s Peek-a-WHO? And Peek-a-ZOO! Each is captioned with a rhyming phrase: “Peek-a Goo” shows the pulp in a pumpkin, “Peek-a Flew” shows some bats, and so on. A nice guessing game but not an essential purchase. Newman, Tracy. Hanukkah Is Coming! Illus. by Viviana Garofoli. Kar-Ben, 2015. 12p. $5.99. ISBN 978-1-4677-5241-1. The title phrase is repeated after each two-line rhyme per page in this simple introduction to the holiday. Storytime listeners can call out that repeated phrase, and the color collage illustrations will work with a small audience, and of course, one-on-one. Children are likely to understand the candles, chocolate coins, latkes, and dreidel, but hopefully the parents can expand the text with a story about the Maccabees. Good for daycare and preschool groups looking for a simple read-aloud about Hanukkah. Night & Day Studios. Peekaboo Presents. Illus. by Corey Lunn. Candlewick, 2015. 20p. $7.99. ISBN 978-0-7636-7567-7. Based on an app with the same name, the board book version asks the reader “What’s in the [color] box?” under the Christmas tree. In each instance, the reader lifts the flap on the box of that color to see what gift Santa has brought. Along with the color cartoon illustration of the gift is the name of that item, making this useful to emergent readers. Readers can benefit from the repeated pattern of the text, and the book also demonstrates the names for colors. As a board book, this works very well if you need something with a Christmas theme, and works independently from the app. Readers can also go to the Night & Day Studios website to play a related game. Opie, Iona, ed. 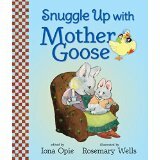 Snuggle Up with Mother Goose. Illus. by Rosemary Wells. Candlewick, 1996/1999/2015. 24p. $8.99. ISBN 978-0-7636-7867-8. Nursery rhymes and illustrations from Opie and Wells’ two large picture book compilations of Mother Goose, 1996’s My Very First Mother Goose, and 1999’s Here Comes Mother Goose, are adapted into this smaller book that is perfect for babies. The traditional British rhymes are matched to illustrations of bunnies, cats, and other animals in human dress, demonstrating Wells’ grace and charm. The rhymes are arranged by subject, from morning until nighttime; this would make a great gift as well as a library purchase due to its sturdy pages and cover. Browne, Anthony. One Gorilla: A Counting Book. Candlewick, 2012/2015. 24p. $7.99. ISBN 978-0-7636-7915-6. This counting book focuses on members of the gorilla family, including orangutans, mandrills, macaques, and lemers. Younger children can count each animal on the page and learn the numerals, and older children can discover the primates (including humans). Browne’s realistic paintings show the animals with engaging facial expressions, showing their intelligence. Even in this smaller size, this book is effective. Waddell, Martin. Owl Babies. Illus. by Patrick Benson. Candlewick, 1992/2015. 22p. $6.99. ISBN 978-0-7636-7961-3. This storytime classic has been adapted into a hand-held board book, but doesn’t really lose anything in the change, except this version is too small to use at storytime. But one-on-one, this is an excellent book on a mother’s love, with a text that contains repetition. The black ink and watercolors depict a dark night in the forest and work fine in this smaller size. An excellent choice for libraries. Haughton, Chris. Shh! We Have a Plan. Candlewick, 2014/2015. 40p. $8.99. ISBN 978-0-7636-7977-4. Three hunters with nets are trying to capture a red bird, but fail every time; their small companion attracts a plethora of birds with some crumbs but the hunters are soon outnumbered. Even young children will appreciate the humor in this anti-hunting tale, with the smallest person as the hero. The brief text contains repetition that will engage listeners, and the digital illustrations emphasize the dark forest using shades of blue. Use the picture book version for storytime but offer this to parents for sharing at home. Carle, Eric, and Friends. What’s Your Favorite Animal? Holt, 2014/2015. 28p. $8.99. ISBN 978-1-62779-303-2. This collection of short poems and phrases along with original artwork by a variety of children’s book illustrators is a project to raise funds for the Eric Carle Museum of Picture Book Art in Massachusetts. There are fourteen entries, from Nick Bruel to Mo Willems, and each offers his or her take on their favorite animal. Unfortunately, in many cases, the texts are too long and the illustrations too detailed for the board book audience. The picture book edition is preferred over this one. Sutton, Sally. Construction. Illus. by Brian Lovelock. Candlewick. 22p. 2014/2015. $6.99. ISBN 978-0-7636-7975-0. Sutton, Sally. Construyendo. [Spanish edition]. Illus. by Brian Lovelock. Candlewick. 22p. 2014/2015. $6.99. ISBN 978-0-7636-7975-7. Short rhymes, onomatopoeia, and realistic illustrations depict various tools and vehicles important to construction. From digging for the foundation to moving in, readers will learn how a library is built in either the English or Spanish language versions. A great book to read on opening day of a new library! This entry was posted in Board Book Round Up and tagged Board books. Bookmark the permalink.